522 pages | 33 B/W Illus. This text offers a rethinking of the field of international political economy in an era of growing but uneven globalization. Even as global integration advances, states play central roles as partners with the largest of global firms, as the catalysts of competitiveness and economic growth, as the creators of global institutions, and in promoting and responding to global interdependence. Indeed, the struggle for power and wealth within and among states underscores the primacy of politics in understanding current realities. At the same time, new issues and actors complicate the global agenda as it expands to address the environment, global health, and food security. By offering a clear explanation of basic concepts, contextualizing the presentation of theoretical debates, and placing current events in historical context, International Political Economy ensures students a deep understanding of how the global economy works and the ways in which globalization affects their lives and those of people around the world. Engages debates over the reach and significance of globalization. Examines the sources and consequences of global financial instability. Explores the origins and consequences of global inequality. Compares various strategies of development and state roles in competitiveness. Discusses the role of key international economic institutions. Considers the impact of the rise of China on the global economy and the potential for war and peace. Illustrates collective efforts to fight hunger, disease, and environmental threats. Includes numerous graphs and illustrations throughout and end of chapter discussion questions. Links key concepts for each chapter to a glossary at the end of the book. Provides a list of acronyms at the outset and annotated further readings at the end of each chapter. Offers additional resources on a web site related to the text, including a list of links to IPE-related web pages. 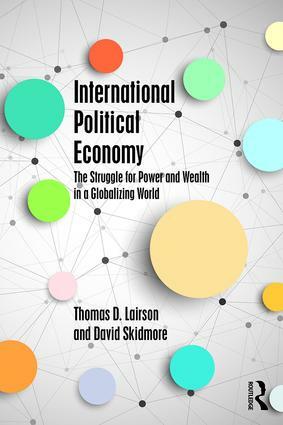 Lairson and Skidmore’s invaluable textbook captures the profound dynamism in the international political economy, provides a sophisticated synthesis of the intersection of politics and economics, and treats the student with respect even as it explains complicated issues or concepts. This new text incorporates the 2008 global fiscal crisis, the full emergence of China as a global power, and the ever-changing politics of global inequality, sustainable development, and environmental diplomacy. This book will be a welcome addition to the international political economy classroom! This book is by far the most comprehensive, insightful, and accessible introduction to the rapidly expanding field of international political economy. The authors expertly draw upon both theoretical perspectives and real-world experience to offer an analysis of global political economy that is unsurpassed by any other textbook. This is probably the best textbook treatment of the international political economy field, and ideal for courses on IPE or globalization. Lairson and Skidmore provide students with needed background in political science theory and the history of globalization; include an excellent discussion of economic concepts necessary to study the politics of trade, finance, and development; and then apply these concepts to the central questions of modern globalization. Lairson and Skidmore offer a first-rate introduction to the study of international political economy that provides students with a wealth of perspective and information about the causes and consequences of globalization. Today’s students will be well-served to begin their analysis of the past, present, and future of global economic relations with this excellent text. Thomas D. Lairson is Visiting Professor of Political Science at Jindal Global University and Emeritus Professor of Political Science at Rollins College. David Skidmore is Professor of Political Science at Drake University. The following resources are online and available for download by following the links below.